Note: I wrote this piece for my friend Tuffer’s magazine project. I’ll post the link to it soon! Last weekend was a crazy pop cultural roller coaster. After wallowing in an endless rotation of Jackson 5 singles and seriously epic music videos, I came up for air to do some baking. And what better way to escape a pop-induced funk than baking cupcakes? My cake of choice was a butter cake spiked with Grand Marnier. I matched it up with a classic buttercream made with strawberries. Let’s say the buttercream icing is the “Rock With You” of the combo: sweet and fluffy, the roller skates, smoke machines and disco of desserts. Then, think of the cake as the “Wanna Be Starting Something” of the pair. That song was my jammy joint – it makes me want to put on a zipper jacket, break in some of those white and red stiff-leather Nikes and make a mix tape with my sister. The song seems bubbly and innocuous at first, but then you listen to the lyrics and are like, “WTF?” For the cake, the hit of booze is your little WTF moment: a little dark, a cupcake for grownups. Alright, I’ll admit the analogy was a stretch, so let’s talk about strawberries instead. June rolled around and earlier this week, I started seeing Wimbledon on the tube. All the snooty tennis snobs on the grounds hogging down strawberries and cream always remind me that it’s time to buy the sweetest strawberries of the year. For this recipe I decided to compare two types of buttercream: Italian meringue versus Swiss meringue. I had previously done a comparison of American butter icing (butter and powdered sugar) and Swiss meringue buttercream; the meringue being my clear favorite. After buying the excellent baking book, CakeLove (a cookbook from Warren Brown’s famed CakeLove bakery in DC), I decided to finally try Italian meringue buttercream. I had never tried it before because, frankly, it is kind of a pain in the neck to make. With Swiss buttercream – shall we call it the Federer of icings? – you heat and whisk sugar and egg whites together, then add butter. Simple elegance (Federer). I prefer the Italian buttercream, but I guarantee, either one will be killing it. 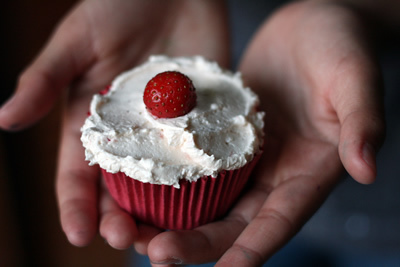 Go simple and use a spatula or butter knife to spread the icing, top with a beautiful little local strawberry, enjoy the June weather, blast “I Want You Back”, tune in to Wimbledon, and have your cake and eat it too. Preheat oven to 350 degrees F (175 degrees C). Line muffin tins with cupcake paper, then spray surface with a little non-stick cooking spray. If making a large cake, line the bottom with parchment paper (don’t grease the sides). Combine the milk, cream, vanilla and Grand Marnier in a measuring pitcher. Set aside. 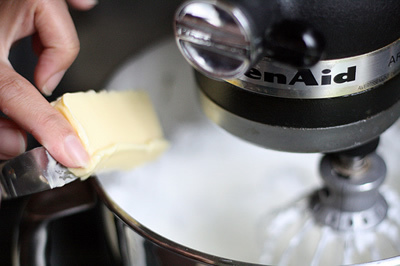 With the paddle attachment on a stand mixer, cream together the butter and sugar for about 3 minutes on medium speed. Add the eggs one at a time, making sure each egg is fully incorporated before adding the next. When all eggs are added, continue mixing on medium for about 3 minutes. Lower the speed to low. Alternate adding the flour and the milk mixture in 2-3 additions, starting and ending with the flour. Spoon out into the muffin tins. Bake for 18-20 minutes, rotating the pan halfway through baking. (For a large cake, bake for 25 minutes.) Check with a skewer to make sure there are only crumbs clinging to it, not batter. Cool on a baking rack to room temperature while you prepare the icing. The key here is that you have a candy thermometer – it is essential that the sugar syrup come to 245 degrees F (118 degrees C), otherwise the icing will be too soft. For either of these icings, make sure to serve at room temperature; just like butter, it hardens up and becomes unappetizing straight out of the fridge. 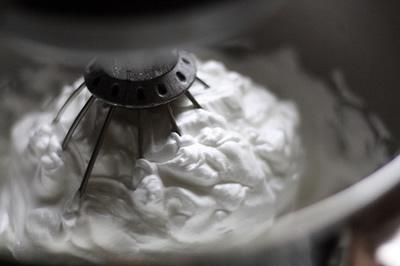 Prepare the egg whites in a stand mixer with the whisk attachment. Don’t start mixing just yet – you will be making the sugar syrup first because that takes longer. 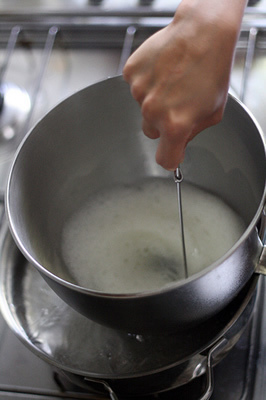 In a small saucepan, add the 1 cup of sugar and pour the water over it. On low heat, tilt the pan gently until the sugar and water start combining (don’t stir it!). When the sugar has mostly dissolved (you will see it becoming less and less gritty), raise the heat to medium-high. Wait for the mixture to come to a rapid boil, then cover immediately for exactly 2 minutes. In the meantime, start beating the egg whites on high speed. Uncover the sugar mixture after the 2 minutes. Continue tilting around the pan – you are going to bring the mixture to 245 degrees F (118 C, use a candy thermometer). As the sugar mixture approaches 245 F (118 C), add the remaining 2 tablespoons sugar to the egg whites. As soon as the syrup reaches 245, immediately remove from heat, and with the mixer running, slowly pour the syrup into the egg whites. Try not to get any on the side of the bowl because it will just harden there. Continue mixing at medium-high speed for 5-7 minutes, until the mixture has cooled to room temperature. Add 1/3 cup of the strawberry puree and beat until incorporated. In this recipe, you will also need a thermometer to make sure the egg mixture comes to 140 degrees F. This has a tendency to separate during the butter addition stage. Don’t panic: just keep beating the mixture and it will come together after a while. (It’s actually amazing to watch.) Again, serve this at room temperature. You can store it in the fridge before icing a cake, but if you do, take it for a quick whirl in the stand mixer before you start icing. Prepare a large saucepan that will fit your mixer bowl filled with water. Heat until it is simmering. Keep it over about medium heat. Combine the egg whites, sugar, cream of tartar and water in the mixer bowl. Have a thermometer handy for when you will have to take its temperature. Remove to your mixer fitted with the whisk attachment. Whisk on high for 5 minutes, until it is at room temperature. Add the butter 1 tablespoon at a time. Again, if it starts looking curdled, don’t worry, just continue beating the tar out of it and believe me, it will magically come together again. Add 1/3 cup of the strawberry puree and beat until combined. Strawberries. Cake. 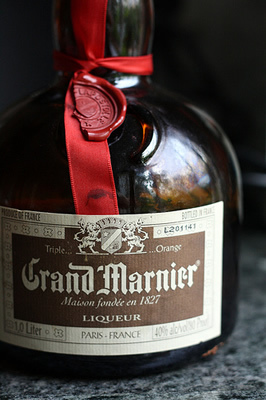 Grand Marnier. I’m in. Don’t know about the Swiss meringue buttercream, though. It scares me. One of these days I will have to master it. Now that I am a proud owner of a KitchenAid mixer, there’s really is no excuse. The first picture is gorgeous. It looks *exactly* like the kind of cupcake I doodled as a child. Beautiful! Love a cupcake for grown ups!! Love your pictures too! Saw the link for SheSimmers Twitter and had to come, but I had no idea what sort of trouble was in store – these little beauties look delicious! @Leela: I know the feeling. Before I made buttercream, the process kind of freaked me out, but if you’ve ever made a sugar syrup, you’re already halfway there with the Italian one, and if you’ve ever made a sabayon, you are halfway there with the Swiss! Enjoy your KitchenAid — you’ll wonder how you ever lived without it! Wow, what a great cupcake idea. The cake alone is a winner! Oh yum!!! What a fabulous cupcake! Thanks for the step by step too!! I love that first pic! Hiya, Sheryl! Thanks so much for posting the frosting recipes – the Swiss meringue recipe has turned out to be the favorite with everyone I bake for. I must admit, it is the best frosting I’ve ever tasted. Can’t wait to try the Italian recipe! But, just one question: in the comparison between the Swiss and Italian meringue frostings, the instructions for the Swiss recipe say to bring the egg whites up to 140F when tempering, while in the two previous entries containing the Swiss meringue recipe, the instructions say to bring the temperature up to 160F. I had thought that 160F was the temperature of choice…but why the difference? Thanks again! I think today might be the day I try the salted caramel buttercream on vanilla cupcakes. Hi Kate! Thanks for your comment, and also for catching inconsistencies! 140F is the right temp — I should correct it in the previous entries. 140F is the temperature where the egg whites reach a ‘safe’ temperature, so there is no need to heat it beyond that. I will definitely correct in the other entries. Wow! those grand marnier cupcakes look too good to eat! You decorated them so elegantly I just wanted to let you know that I have an award for you on blog! I have a question – I made the strawberry Italian meringue buttercream yesterday and it was very good – my husband actually compared it to homemade strawberry ice cream – but I do have a question. The flavor is quite ‘buttery’, which isn’t really a bad thing but I think I’d like a more even balance between buttery and sweet. Do you think there would be a problem with using 2 sticks of butter instead of 3? Thanks, and I am really enjoying your blog. Hi Sis, I would say give it a shot with less butter — keep that third stick ready just in case the consistency is not quite right. But I think you will end up with something a bit more similar to ’7-minute frosting’ — basically a sweeter, less rich frosting. Let me know if you do try it! I have the book CAKELOVE. Have you tried the coconut buttercream. I thought I went to heaven when I tried it. It is not your typical buttercream recipe. I LOVE that book! I have it but have not tried the coconut buttercream. But thanks for the recommendation — now I definitely will! I just tried this frosting recipe twice and both times as soon as I added a 1/2 tbsp of butter it deflated and went watery… what am I doing wrong? I’ve made Swiss Meringue Buttercreams many times before, but can’t get this recipe to work for me… help please! The key to this particular Swiss meringue frosting is that when you add the butter, you will likely see it go all watery. If this happens, don’t panic, just keep adding the butter steadily. Once all the butter is added, crank your mixer all the way up and it may take a couple of minutes, but the whole thing will magically come back together again. (when I first started making Swiss meringue buttercream, I also thought that the frosting was ruined when it separated at first!) Basically just keep in mind to ‘beat the crap out of it’!